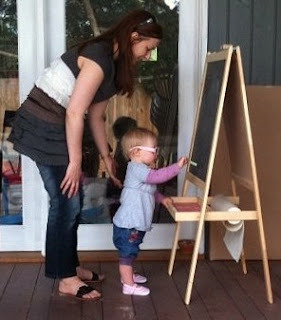 Today we are participating in Babble On's Wordless Wednesday! So great when they have a whole new range of things to do. That is such a gorgeous photo! We have one of those blackboards too! It must be so exciting being a little one learning to stand and seeing a whole new world! Thanks for the comments ladies. Kebeni, We love the glasses too. She never wants to take them off. Certainly not a bad thing! Clairey, a whole new range of things for Mum to do too, which makes being a SAHM very exciting again! Ashleigh, how old is your little one? Certainly exciting for me but My Cam is such a cautious little thing. I think she is more anxious than excited about the standing. MAKE YOUR OWN 'WINKY, WONKY DONKEY' PUPPET!